Door knockers can provide annoyance, passers by can be possible intruders and sometimes you want to see the people that come to your home, before they see you. The best way to play the eye spy and see game is to have an intercom system for your home. Not only does it provide you with greater security and real peace of mind, it brings convenience to your home as well with many systems able to be programmed to open a door or gate. There are many different systems to choose from, each with various pros and cons. We will happily assist in choosing the right system for you. Access Control – Take it one step further. Access your entry or exit points with the use of Electric lock or Magnetic lock fitted to any door using a code pad, access cards or biometric-readers which use the code of your finger print to activate the lock. Throw away the KEY and feel safe and secure, knowing that your premises are safe and only accessible by YOU! 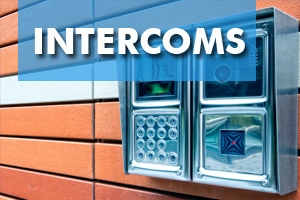 Click here to email us for more information or a quote on intercoms and access control.